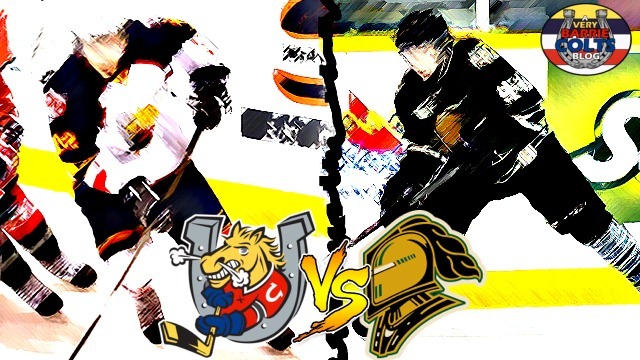 Game Preview: Barrie Colts vs London Knights. #OHL - Very Barrie Colts | A website covering the Barrie Colts of the OHL. Tonight the Barrie Colts are in London to face the Knights for the second meeting of two this regular season. London took the first meeting with a 6-3 win over the Colts at the Barrie Molson Centre in December. Barrie put in a solid effort in the 3rd period putting up 3 goals but it wasn't enough to break the 6 goal lead London had to start the period. Tonight's matchup has the potential to be a high scoring game. Not only because both put up a total of 9 goals in their meeting this past December but 4 of the OHL's 5 top point leaders are featured. London comes into tonight's game with a 6-4-0-0 record over their last 10 games. Their last game was this past Monday when they defeated the Flint Firebirds 5-2. London had an early 2 goal lead over the flammable birds but Flint would tie the game early in the 3rd period. Shortly after the goal London would take the lead on a Dvorak goal (42 of season) with assists to Marner and Tkachuk. London would put up 2 more goals to clinch the victory. Barrie has been solid over their last 10 games with a 8-1-0-1 record. They are coming off of a tough 6-4 loss at the hands of Kingston on Monday which not only helped the Fronts hold on to their first place spot in the Eastern standings but also clinched their playoff spot. Barrie still had a strong showing for the most part despite not managing to pull out the win. Andrew Mangiapane managed to up up 2 goals and an assist while Kevin Labanc scored a goal and got an assist on one of the Mangiapane goals. How will the Colts be able to slay the Knights tonight? Keys to Success: Score the most goals. KIDDING! Well, not really.. That is how you win, London scores more goals than any other team in the OHL. They have scored 253 this season. Good news for Barrie is their 221 goals are the second most in the OHL. Both also don't let a lot of goals against so there is a good chance this game will be won in the defensive zone. Try not to take too many risks because London will make you pay for any mistakes and/or give aways. And mainly, the Colts need a good night from their goalie. Players to Watch: Julius Nattinen currently is riding a 5 game point streak. In those games he has put up 3 goals and 8 assists. Also don't be shocked if all those guys who like to score points that we mentioned earlier decide to produce as well. The game is set for a 7:30 puckdrop! Also, the game appears to be on SportsNet! So thanks you to London for that.